Rice dishes like Barbeque Pork on Rice, known in Thai as Kow Moo Dang, are classic Thai lunch fare. In a noodle shop, you will find tall green onions sitting in a jar full of vinegar on your table, waiting for your Kow Moo Dang. Take a bite of kow moo dang and munch on green onion at the same time. You get barbeque pork at most Chinese markets and restaurant. 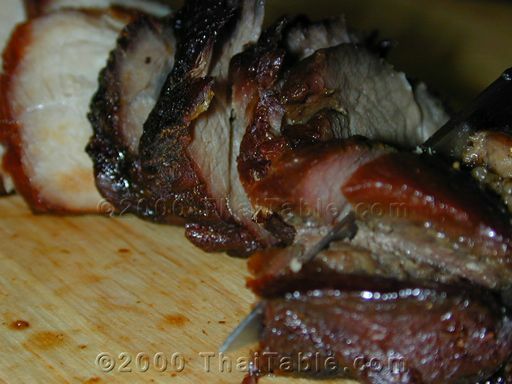 However, a homemade barbeque pork is easier than you think. The recipe describes the Kow Moo Dang that you can expect to find in Thailand. Without the egg, sauce or green onion, the dish still tastes pretty good. 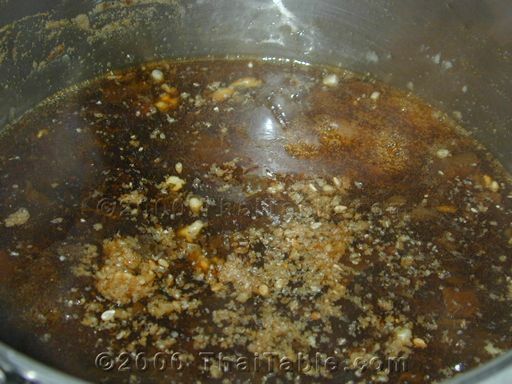 You can substitute dark sweet soy for the sauce that is made from the marinade. 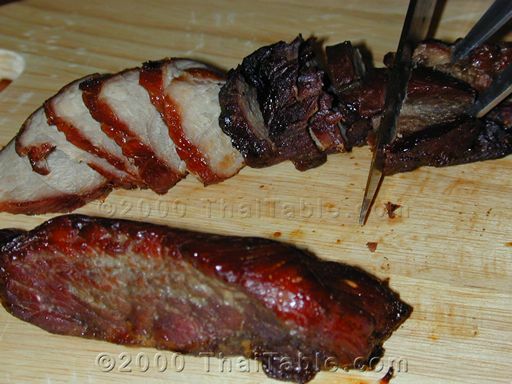 Short cut: Buy already made barbeque pork from any Chinese restaurants and markets. Medium hard boil the egg. 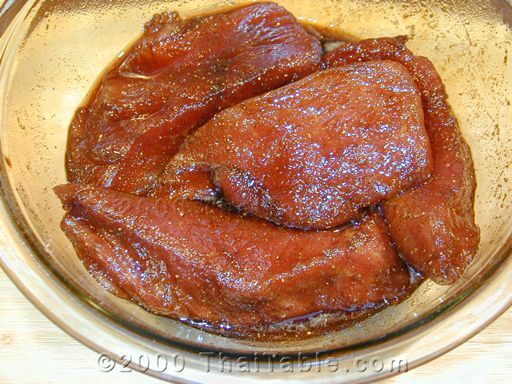 In a small sauce pot or pan, heat up any left over marinade from the barbequed pork (or, if you have purchased moo dang from a store, make 1/2 cup of the marinade). Peel the egg and drop it in the sauce to give the color to the egg. Add 2 tablespoons of flour to 2 cups of water and mix well. Add the flour water to the sauce to thicken the sauce. 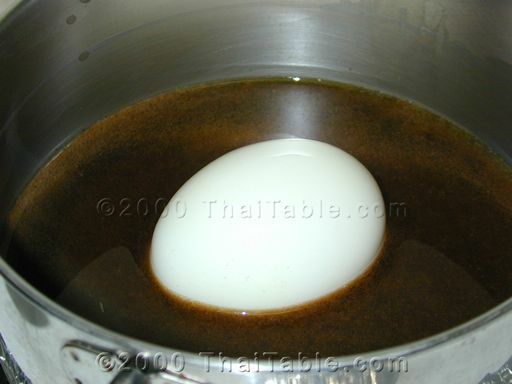 Turn the egg over to coat it in the sauce until the white part turns brownish red (like the sauce). Bring the sauce to a boil, remove the egg and set it aside. Add the vinegar and the toasted sesame seeds. Taste the sauce. It should be a little salty and sweet. Add more soy sauce or sugar if needed. Put the cooked rice on a plate. In Thailand, the cook often compresses the rice in a small bowl first and then flips the bowl onto the plate so that rice is neatly formed. 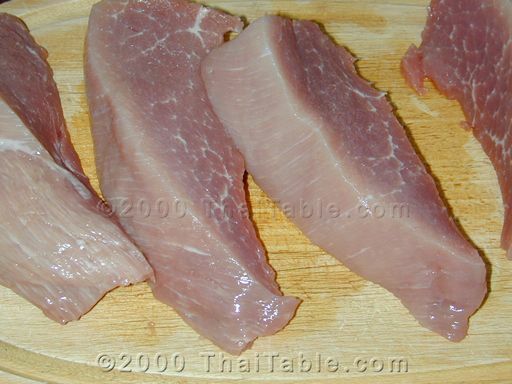 Slice barbeque pork into very thin slices. Arrange the pork on the dish. Garnish with sliced cucumber, green onion, and sliced egg. The onion should be about 6 inches long from the white part to the green leaves. Spoon a couple of spoons of sauce on top. It is ready to serve.